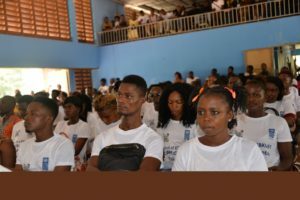 The Ernest Bai Koroma University of Science and Technology in Makeni town on Friday 30th November formally opened its new Career Advisory and Placement Services Center (CAPS) with support from the UNDP. The CAPS was initiated by the National Youth Commission (NAYCOM) and kicked-off in 2014 to chat the career pathway of its young people in tertiary Institutions/ universities. In his statement, NAYCOM’s Commissioner, Ngolo Katta, said CAPS has now been established in five major learning institutions in the country— University of Sierra Leone, Njala University Bo and Mokonde Campuses, Eastern Polytechnic in Kenema and the EBK University of Science and Technology. “We want to nurture university students in career guidance and job readiness Programmes, so therefore CAPs is a novelty and a standard practice to enhance youth employability. We therefore entreat various Vice Chancellors/Principals to continue to support and sustain the CAPS established and to institutionalize CAPS processes in their institutions with trained counsellors, mentors, etc,.” Mr. Katta said. He added that the Commission had established CAPS clubs in secondary schools because “I believe we have to catch them young”, building a successful career pathway begins right at that level. He promised that more CAPS clubs will be established in 2019 as well as work with the existing CAPS centers to ensure serious dialogue on its institutionalization as exposed by the Vice Chancellor and Principal of EBKUST. Prof. Momoh said students will be trained to be peer career advisers and mentors to each other. Ann-Marie Bassie, Programme Specialist of the Youth Employment and Empowerment Programme in UNDP said, CAPS provide comprehensive services for enhancing and increasing employment opportunities for students, by providing valuable skills for employment and matching jobseeker skills to employer needs. “Youth development remains top on the agenda of the UN, this is epitomized by the recent launch of the UN Youth Strategy by the UN Secretary General,” she added. Mrs. Bassie said UNDP in SL will also review its approach to youth development building on lessons learned and best practices from its Youth Employment and Empowerment Programme (YEEP). She said the YEEP which is ending this year included, the implementation of the Business Development Services (BDS), The Career Advising and Placement Services centers (CAPS), The Graduate Internship Programme (GIP), Sierra Leone Agricultural Business Initiative (SABI), and Policy and institutional development programme supported by UNDP and implemented by MOYA and NAYCOM. The programme also provided support to the Ministry of Youth Affairs (MoYA) and National Youth Commission (NAYCOM) to empower the youth to develop their potential, creativity and skills for national development. The programme was launched by Mr. Mohamed Onanah Jalloh Deputy Executive Director of the National Youth Service NYS, deputizing the Minister of Youth Affairs who was absent due to other engagements with partners.